days – certainly more than ever heard him during his lifetime. For many of us, Mozart is enjoyed during an evening out to the opera or concert hall. We hear Mozart on our stereos and car radios. We use his music to unwind after a long day, to make our dinner hours more pleasant, or as background music at our workplace. But for tens of thousands of people at Tomatis centers around the world, the music of Mozart is used as a vital therapeutic tool. All 150 Tomatis centers use Mozart’s music to help pull autistic children out of their cocoons, to enable singers to improve their voices, to assist dyslexics with reading problems, even to help adults learn foreign languages faster. In one case, a pregnant woman in the ‘Tomatis program’ played Mozart on her stereo every day. Three days after her baby was born Dr. Tomatis put a pair of headphones on the infant. Dr. Alfred Tomatis was born into a musical family. His father was an internationally renowned operatic bass, and as a child he was surrounded by music. Tomatis graduated from medical school as an ear, nose and throat doctor. 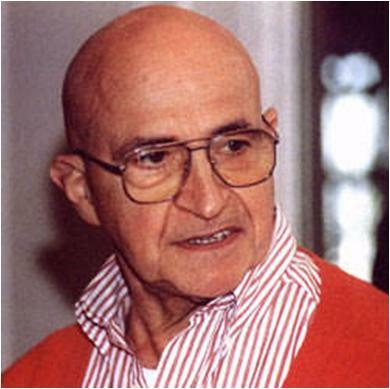 In the 1940’s, he was hired by the French government to administer hearing tests to employees of an airline company. At first, the employees feared for their jobs, and their hearing tests showed near-normal hearing. But when they found out the hearing tests were to determine if they were entitled to disability compensation, their “hearing” abilities registered considerably lower! Tomatis realized that standard hearing tests were measuring listening as much as they were hearing. In fact, the mechanics were indeed suffering from hearing loss; they complained of exhaustion, irritability, and poor communication with friends and spouses. At the same time, Dr. Tomatis was trying to help opera singers (referred to him by his father) who were having vocal problems. Some had breaks in their voices, while others had simply lost the rich tones they once produced. They too complained of the same psychological symptoms. Tomatis soon realized that hearing loss, especially in the high frequencies, profoundly affected the brain and its function. After studying research on sound imprinting in animals, he began to formulate his theory that sound is the sense that gives continuity to our lives it is me fundamental building block of learning and communication. Konrad Lorenz discovered that certain species of nonsinging birds could be trained to sing, if they were raised by a mother bird of a species that did sing. Conversely, singing birds raised by non- singing adopted mother birds did not learn to sing. Researchers went a step further, talking to a batch of duck eggs every day. When the ducklings batched, they immediately followed the sound of the researchers’ voices. These experiments caused Tomatis to wonder how human fetuses experience sound while in the womb. He found that the human ear is the first sense organ to be fully developed in a fetus (only four and a half months into pregnancy). Even before its full development, the fetus is responding to sounds through “bone conduction,” or the vibrations, which can be felt in the body as sound passes through. The amniotic environment of the womb makes only high-pitched sounds audible. The fetus hears the repetitive rhythm of the mother’s heartbeat, the inhaling and exhaling of the mother’s bream, and the assorted sounds of the mother’s digestive tract. From inside the womb, a mother’s breathing sounds almost exactly like ocean waves pounding on a beach. Then, at various unpredictable times, the fetus hears the high, squeaky sound of its mother’s voice as it is filtered through bone and amniotic fluid. For the last five months of pregnancy, the fetus is listening to these sounds and beginning a lifelong learning process. Because the fetus is used to very high-pitched sounds, we often instinctively talk to babies using a high-pitched voice. We develop “baby talk” to communicate and sing repetitive songs – and infants respond to us because these sounds resemble what they first heard in the intrauterine environment. If the hearing pathways remain open and problem-free, learning and language skills develop normally. But physical and emotional traumas, ear infections, adoption and other life experiences can rupture the auditory connection between the brain and the outside world by breaking off the continuity of sound that began in the womb. The Swiss instinctively know how important sound is to children: in their country, people who can´t sing in tune are not allowed to be teachers! Dr. Tomatis “notes that 60% of children with language problems have a history of ear infections during the “critical periods” of early language development, and 30% of adopted children have dyslexia or some kind of learning disability. In the former case, Tomatis suggests that the inability to hear the fall spectrum of sound affects the brain’s ability to replicate sound. In the case of adopted children, the loss of the mother’s voice imprint creates a rupture in the sound imprinting from the womb; the child’s world has no auditory anchor upon which language skills can be easily built. These early problems can have a profound effect on a child. Dr. Tomatis believes that our brains needs three billion stimuli per second about four hours a day to be fully conscious. According to Tomatis, about 60% of these stimuli come from sound and vibration, which is to say that dysfunctional hearing or listening can profoundly impact a person. If our ability to listen to and process sound is dysfunctional, we lose a tremendous amount of beneficial brain stimulation. The job of the people at the Tomatis centers is to heal the client’s relationship to sound. The results have been surprising. 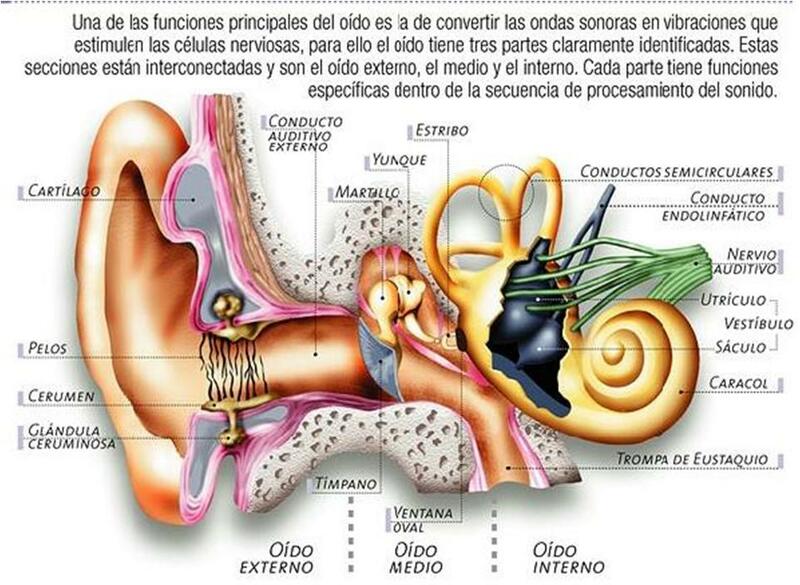 The ear is divided into two main systems. The cochlear system is the part of the ear that is used for actual hearing. And what happens to sounds that pass into our ears? They are translated into electrical impulses for our brains to process. According to Dr. Tomatis, these electrical impulses are crucial to proper brain function. In fact, the commonly accepted definition of death is the cessation of electrical activity in the brain. According to Dr. Tomatis, sounds are literally nourishment for the brain. And this is where Mozart comes in. 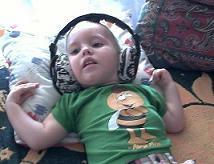 If a child or adult is unable to listen to and process sounds, brain activity is literally slowed down. The individual may feel tired or depressed. Since Dr. Tomatis was raised around opera singers and classical music, he noticed some things. Opera singers are almost always very energetic. They can sing a matinee and evening performance of a demanding opera, then go out to a party after the last performance of the day. Their posture is usually open, and their body gestures convey joviality and lightness. 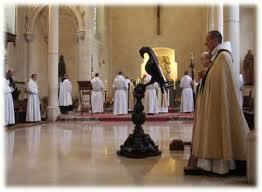 The same is true of Benedictine monks, who chant several hours a day. The sound of their own chanting so energizes them that they get by comfortably with four to six hours of sleep a night. Tomatis believes that this is because their brains are literally receiving electrical charges from the music they create. He has also observed that since the changes in the Catholic Church brought by Vatican II, a number of monasteries stopped chanting, while others chose to continue their chants. All the European monasteries that have closed since 1967 are monasteries that have discontinued chanting. In one of these monasteries, the monks started sleeping almost twice as long as before and still felt tired, depressed and in poor posture. The doctors couldn’t help them. Dr. Tomatis ordered them to return to their chanting, and their high energy levels returned. If these benefits are available to professional singers and monks, can similar results be possible for a non-musician with language or learning difficulties? Dr. Tomatis thinks so. He experimented with a wide range of music, which he administered to his clients. Beethoven and Tchaikovsky were stimulating, but had too much individual personality. Chopin and Schumann made people feel a little depressed. African drumming, religious chants and other musical styles had associations that distracted a large percentage of the clients. But the music of Mozart was universally accepted, even loved, and was shown to have the highest rate of therapeutic success in the program. So now, tens of thousands of people around the world listen to hundreds of hours of Mozart as part of their therapeutic process. For people who have suffered a traumatic birth or the separation of adoption and now suffer from listening dysfunctions, the Tomatis method takes them back to the kind of hearing their bodies remember from the womb, when their hearing and listening processes were still functioning well. To do this, the client simply puts on a pair of headphones. If appropriate, the sounds of the individual’s mother’s voice are used. The voice is electronically filtered so that only the very high-pitched overtones are audible. In addition, the sound is transmitted directly through the top of the skull so that the client can feel the vibration of the sound through bone conduction before hearing it with the ear. When five-year-old children hear this kind of sound, they may crouch into the fetal position. One child even pointed to his mother’s belly after a session and said. “I was there!” These sounds reawaken the brain pathways, “exercise the ear muscles,” as it were, and get the brain back on track with its listening functions. For people who suffer physical or emotional trauma, the brain adopts a number of defenses, some of which involve the auditory pathways. Dr. Tomatis believes that the right ear has a more direct neurological pathway to the brain than the left ear. If a child is incessantly yelled at, he or she might develop a “left-leading ear,” which means that most sounds are processed through the left ear. The neurological pathway is longer, and therefore the sound and fury come through a bit more muted. The headphone sounds can be used to attenuate the right ear to better listening, and give a greater sense of “presence” to the client’s listening. 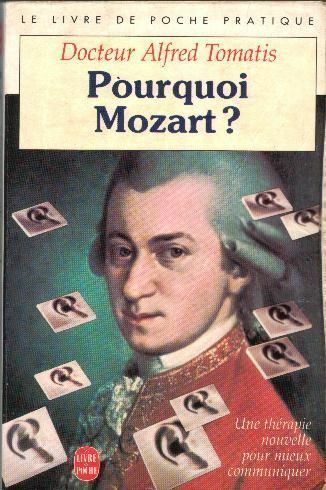 good mother.” He recently wrote a book called Pourquoi Mozart? which explains (in French) exactly why Mozart’s music works so well in his therapeutic setting. There is a “lightness of being” in Mozart’s music that is always uplifting. His music emphasizes the upper register of the sound spectrum, with brilliant passages for violin and the high notes of the piano. For music lovers and musicians, the sound of Mozart run through an elaborate array of bypass filters can be truly jarring. This writer got a mild headache from the first Tomatis demonstration. But in time, the experience becomes less shocking as the focus changes from listening to music to activating the neurological pathways from ear to brain. The Tomatis method has not been fully accepted by the scientific community. Not enough double-blind studies have been conducted to prove its effectiveness to a skeptical scientist. But as one parent of an autistic child put it, “We don’t have time to wait for such test results.” According to the Tomatis practitioners themselves, clinical experience reveals that their techniques can work. Over time, clients have a chance to reconstruct the hearing patterns that were not properly developed in infancy or early childhood. Autistic children who block out the normal range of hearing needed for understanding human language may suddenly begin to communicate. For some, emotions rise to the surface, which are often dealt with by drawing and other forms of release. Realigning the listening process means that children who could hardly walk are suddenly able to ride bicycles, as their vestibular systems begin to function normally for the first time. Children with violent carsickness can ride on winding mountain roads. People with language problems have a chance to go back and reconstruct the normal process of learning through sound, which is so vital for communication. Dyslexics catch up on their reading skills as they reconstruct the phonemes and sound blocks basic to understanding language. Adults who want to learn a new language can learn it the way children learn language – with considerably more ease – by hearing the unfamiliar language the way infants and toddlers learn their native tongue. People with low energy or problems with depression reopen their listening pathways and “feed” their brains with an abundance of new stimulation from the outside world, energizing and literally “charging” their brains with millions of new electrical impulses that never got through before. Alfred Tomatis believes that listening means even more: it means being connected to the entire universe, even to the Divine itself. A glance at any biblical Concordance would prove that Tomatis is only echoing the words of the early religious writers – the most commonly used words in the Bible are “Listen”, “Hear”, “Sound”, “Lord”, and “Go”. 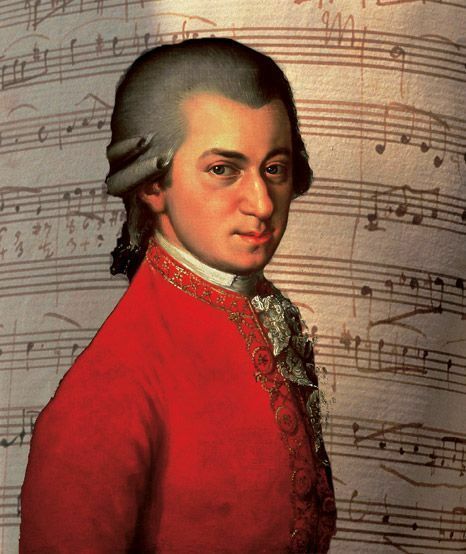 Mozart almost certainly never dreamed that his music would be used for therapeutic purposes. But Mozart himself was born into a musical family. His mother’s cello rested near her belly every day during her pregnancy. Mozart was literally learning music before be was born. For reasons that no one can fully grasp, Mozart’s individual personality does not come through in his music as in the music of Beethoven or Tchaikovsky. We’re all born with a certain connection to the Divine. And Mozart’s music is like a ladder to reconnect us to that light in our heart, with the light of illumination from the spiritual source. His music is that bridge, that connection to something beyond our small selves. When we feel that, we become aware that we have a purpose. Dr. Tomatis himself sleeps only four hours a night, and attributes this to a process of energizing his brain several hours each day with Gregorian chants and the music of Mozart. When Dr. Tomatis talks about the power of Mozart’s music to “charge” the brain, be realizes that it is hard to find a single word to describe what happens.